When I was pregnant with Lily, I kept seeing these ads in Parents Magazines that I would read during my bi-weekly doctor’s visits. Yes, I said twice a week doctor visits! Crazy and being high risk I pretty much lived there and this was truly before Kindle and iPad reading. So, I took to the magazines in his office quite well when all else failed. So, like I said I would see ads for different products in these magazines. One such ad was for hand-stamped jewelry for moms. One time Kevin came with me and I happened to show him the jewelry that had caught me eye in these ads. He had decided to buy me one for Christmas that year after I gave birth, because Lily was born in late November and was the perfect gift for the mom of two little girls. I, now, have had that necklace for two years, but had kind of fallen out of love with the original design I chose (plus not going to lie, but my girls birth stones are not very pretty color combo – should have just gone wight he pearls instead) and for some reason my necklace has tarnished a bit, too from age. The company, he ordered from, is no longer in business to try to see if they could help me with this. Even still I recently kept looking online at different companies that make similar necklaces and had even thought to possibly get a newer one in the future for myself. 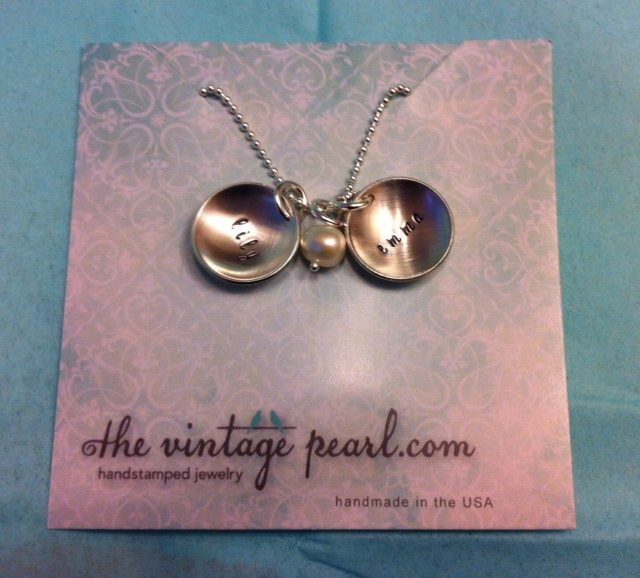 Enter, The Vintage Pearl, who recently became my latest advertiser and offered to send me one of their hand stamped necklaces to review. I was literally ecstatic to get the chance to get a new necklace, review it and also have them advertise with me. But before I even picked my necklace out, I got to know a bit more about the company and how it was started up. From what I learned, the company was indeed started up by Erin, a stay at home mom with 4 young children. She taught herself how to make hand-stamped jewelry all by googling and reading magazines. I was highly impressed with her creativity and ingenuity, too. Plus, I could relate to her doing this to also be able to make money, but stay home to take care of her children, because blogging and designing has allowed me that luxury, as well. Now to explain how easy the process is to pick and have your own necklace or jewelry handstamped and personalized for you, I will share my own personal experience. By the way, from start to finish, this company is truly wonderful and professional, too to design a hand-stamped piece of jewelry with. The first step is to pick out the necklace that I would review, I went to their website and searched the four different necklace categories, simple, unique, vintage and gold. I did indeed choose my necklace, which was from the simple category and known as, Electric Charm Necklace. Once I chose the necklace, I got to decide the chain type/length, the number of charms and the fonts to use and the names for the font. Once the order was placed with my contact, I waited to receive my order (which was only a few shorts days). When I did, I was so pleased and even more excited to see it in person. 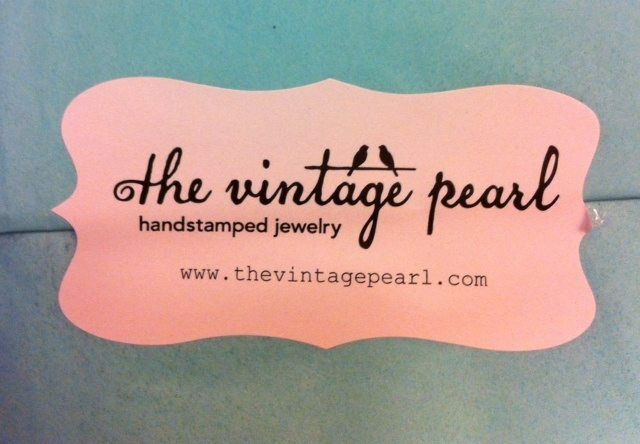 Trust me, if you are looking for the perfect, one of a a kind hand-stamped jewelry for a gift or even for yourself, you cannot go wrong with The Vintage Pearl. Take a look at my gorgeous necklace now, if you don’t believe me (I seriously couldn’t be happier and have worn it constantly still receiving it). 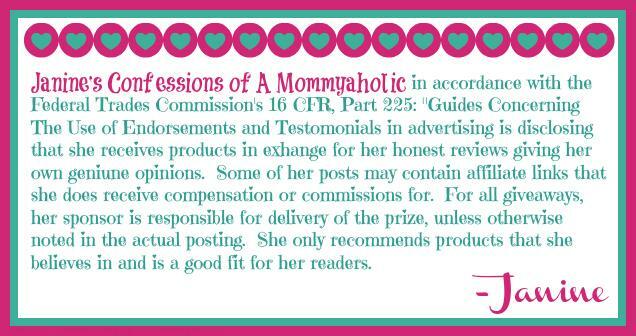 With Mother’s Day, about two months out, this is truly a perfect gift for all mother’s on your list, as well. And today as special offer to all my reader’s, The Vintage Pearl is giving away two $50 gift certificates. Just enter the rafflecopter below to get a chance to indeed win. The giveaway is open to all US residents and all entries will be verified. Happy Birthday to Tiny Prints with You Getting the Presents from them! If you’re not familiar with their top-notch, classy stationery, you should be. Whether you need birth announcements, graduation party or baby shower invitations, photo iPad cases or notebooks, and any of your personalized stationery needs, Tiny Prints has it all. All of their products are customized to your needs. You choose the photos and text to add to their awesome designs and then…you impress the recipients. Oh and the part about there never being a better time? That’s because their birthday is this week and from now through March 4, they are giving you the gift of 30% off everything. That’s their best deal of the year. Don’t forget to enter the rafflecopter giveaway below for your very own signed copy of It’s Really 10 Months below, if you haven’t already. For more on this book, click here. I was so hoping you'd show a photo of yours and you delivered! Really beautiful. I'm not a big necklace wearer, but I do love them. I just like to save that space for something special like this. And I love the story of the company and how helpful they were to you! My recent post Twenty Random Facts About Me, With a Twist! Sorry, you aren't and wish you could be. And so sorry about your necklace being snatched. That is awful and feel terrible for you. I love these necklaces. I have one with Ben & Sean's name but I need a new one to add Owen! My favorite is the Sweet Love Necklace! Oh and the eclectic charm. So many to pick from. Your's looks awesome!!!! Great review! Obviously this was not written with me in mind. LOL Have a great day Janine. I love the vintage pearl! Such a good company. I bought a lovely little necklace for my very first mother’s day! I need a new one for both girls now! Yours turned out great! I've entered for the necklace, that's a great giveaway. I love the spoon charms and the necklaces that show off your state! What a fabulous giveaway, I have been admiring her pieces for a while! I would LOVE to win–Thanks Janine! I absolutely LOVE hand stamped jewelry and it looks like this place makes some quality products!!! My recent post Missing 20 Foot Santa in New Hampshire – Mystery Solved? Stamped jewelry is one of my favorite things! Your necklace is so pretty! I'm crossing my fingers – they really have some beautiful pieces, so glad you shared. I love their stuff, that's exactly the style of jewelry I love. Silver and vintage-y…It's hard to pick one thing but I really love the spoon rings with the initial stamped on. I just got my first spoon ring and I love it but now I'm wanting one of those too! Very cute necklaces. I love personalization because it seems, well, more personal. These are gorgeous! I just started doing hand stamping and it is an art, no doubt! These are beautiful and very personal which makes them a perfect gift. Those necklaces are gorgeous!!! I love the one you designed!! That is a gorgeous and thoughtful treasure! I love jewelry like that and love Erin's designs! – very cool and classy! These are beautiful. I wish I was that creative. Thanks for sharing with Countdown in Style. I'm liking the leather cuffs, messy nest, and the summer bloom necklace.